JOHANNESBURG - South African track officials will meet this week to discuss the future of their president, who admitted to lying about his role in the gender-test case of runner Caster Semenya. Attlee Maponyane, vice president of Athletics South Africa, said the group's council would meet Thursday. Politicians are calling for ASA president Leonard Chuene's dismissal, but Maponyane and other ASA officials contacted yesterday refused to say what recommendations the council might make to the board. Chuene, whose four-year term ends in 2012, refused to comment yesterday when contacted by The Associated Press. 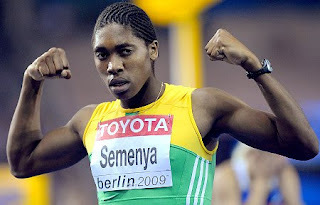 Chuene had repeatedly said gender tests on 800-meter world champion Semenya were done abroad, not in South Africa. Over the weekend, he admitted he knew of tests conducted in South Africa, saying he had lied to protect Semenya's privacy, but refused to resign. The International Association of Athletics Federations has been criticized in South Africa and abroad for publicly acknowledging tests, which under IAAF rules are supposed to be confidential, putting the 18-year-old Semenya at the center of an international media storm in which intimate details of her anatomy made headlines. Semenya won the 800 at the world championships in Berlin on Aug. 19 in 1 minute, 55.45 seconds - 2.45 seconds ahead of her closest competitor. It was the fastest time in the world this year, amid questions about Semenya's muscular physique and recent stunning improvement in times.